Installing a pendant light fixture is a DIY project that will add to your home equity. When the weather is too lousy to build your deck or do some exterior painting, tackle your interior home projects ! 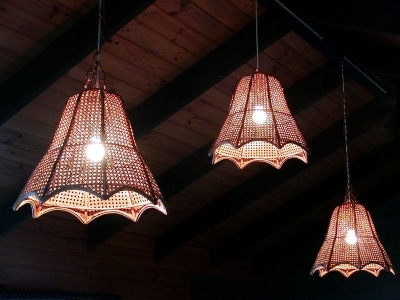 Pendant lights are proving to be popular in the home remodeling market this year. These are lighting fixtures that will add grace, elegance, equity, and curb appeal to your home. The residential housing market is still depressed because of bad Fannie Mae and Freddie Mac mortgage loans (sub-prime loans coupled with ARM loans, or Adjustable Rate Mortgages). Because of this, its just not a good time to sell a home, but it is a prime chance to jump into remodeling projects to raise your homes value. Why not engineer and build a backyard deck, give a bathroom a face lift, or even install a pendant light? You might have heard them called swag lights. Even though theyve been around for quite a while, they have an appeal that continues to sell. If you would like to have a local craftsman do the work in question, I recommend Angies List, where thousands of consumers share their ratings on the local contractors and service companies they hire. Find reliable contractors and doctors when you join Angie’s List today - Use promo code LOCAL to save 15%. The first step is to to consider the best location of your new lamp/s. Some areas of the home need a lot of illumination for activities such as preparing and eating meals, entertaining, or reading. Other places in your home use lighting for accent effects or modern decor. In many cases, these kinds of areas are already furnished with an overhead light. In other situations, this is not the case. Note: Before you undertake any electrical task, ensure that the proper circuit breaker or fuse has been de-energized and that the circuit tests dead using either a Multimeter or a Fluke VoltAlert! Considering the second case mentioned, where theres no existing light, a wee bit more work will be needed in the installation process. Youll have to enter the attic space and use Romex wiring (in most cases, so check your local building code), to tie into an existing power source. There will usually be some sort of light fixture; perhaps just a bare incandescent bulb used for utility purposes. Then, secure an electrical box to a ceiling joist, or to a cripple located between two joists. Hint: To mark the proper location, poke a long nail through your drywall ceiling from downstairs prior to entering the attic. If you have a can or recessed light just where your new swag light will be located, theres a work-saving option. Theres a product named the instant pendant light by Worth Home Products. To install it, you just unscrew your can light bulb or floodlight, then adjust the length of your hanging wire. Then screw in the instant fixture and push up the cover plate. If this is a replacement fixture, first flip the breaker off and verify that its dead. If your breaker is not clearly marked on your circuit breaker box, just turn the light to the on position and then test each breakers until your light goes off. Next, take out your existing fixture. Secure any mounting bracket that came with your new fixture to the electrical box. Match up the wires on the pendant light fixture with the old wires and connect the ground to the electrical box or the bracket, whichever the instruction manual indicates. Use electrical wire nuts to secure the bare wire ends together. Screw in the bulb (consider a compact fluorescent bulb or a halogen bulb for lower wattage use and energy efficiency), and then turn on the circuit breaker, and test it out!